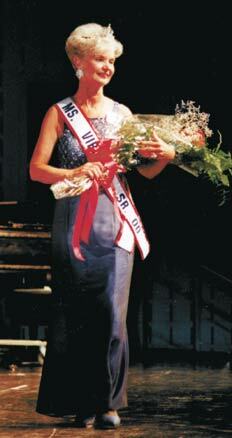 Shelby Jean Byrd, of Staunton Virginia, was crowned Ms Virginia Senior America 2000 and Ms Congeniality, May 20, 2000. Ms. Byrd sang "Crazy," a song made famous by Patsy Cline, and she wore an evening gown that she had made.Ms. Byrd. a real estate broker with 27 years of experience, owns and operates Valley Realty in Staunton. She is a member of the local, state and National Association of Realtors where she has served on various local and state committees. Ms Byrd served as president of the Staunton-Augusta County Association of Realtors in 1987 and was chosen as Realtor of the Year in 1987. For the past 10 years she has taught the realtor re-certification Class.She is a member of the Verona Chapter #4518 AARP where she served as president in 1993 and 1997. She with other AARP members mowed grass, cleaned windows and did home repairs for other senior citizens who needed help. She also sings in nursing-sing homes and for other AARP groups. She says that she has a real love for seniors.Ms. Byrd, who is a member of St. John's United Methodist Church, went on a three day trip with other church members to McDowell County, West Virginia to work for the mission. She installed new plywood and vinyl flooring in a home of a needy family.Other volunteer work she does includes helping the local rescue squad during their radiothon and drive and working as a telephone solicitor for St. Jude's Children's Hospital. She is also a volunteer teacher at the Staunton Correctional Center where she instructs inmates on how to correct credit problems and how to apply for housing after they are released.She enjoys boating, traveling, dancing, sewing, upholstering old furniture and all types of renovation work, including installing ceramic tile and Formica, sanding and refinishing floors and wallpapering. She says that working with her hands is a real joy to her.Ms. Byrd has a son, Larry Lee Byrd of Staunton, a daughter, Terry Lynn Green of Berryville, Virginia and two grandchildren, Scott and Ashley Byrd of Staunton. 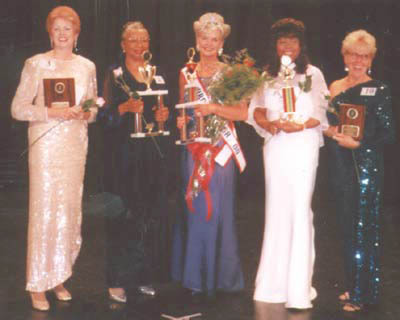 The 2000 Ms. Virginia Senior America winners (left to right) Trisha Gibson of Alexandria, 3rd runner-up; Olivia W. Martin of Chesapeake, 1st runner-up; Shelby Jean Byrd of Staunton, Ms Virginia Senior America 2000; Louise Marie Whitehurst of Norfolk, 2nd runner-up; Karla Tackett of Alexandria, 4th runner-up.